Whilst translating recently a battlefield-related article, I came across the term kinsô’i (金創医) that referred to “physicians” who were specialized in the treatment of incised wounds in general and of arrow wounds and sword cuts in particular. The article did not go much into detail at this point as it was more of a general nature but that term awoke my interest and as hardly anything is available on the net on this topic, I started to do some research the result of which is this humble article. 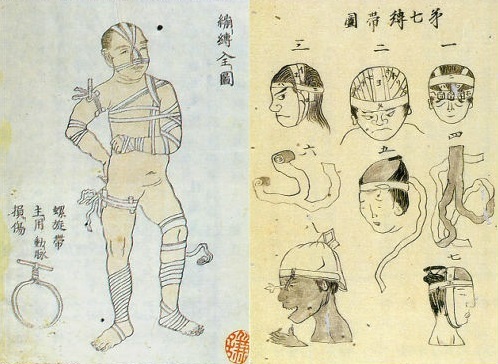 Basically, the ancient and medieval Japanese medical system was very similar to he one in the West. That means, there were academic physicians and partly specialized and partly allround practitioners who were considered lower ranking. This lower ranking was either connected to the fact that these practitioners did not undergo that an extensive training as the physicians, or to certain religious and social stigmas associated with unclean things like blood and the like. As for Japan, the records on “physician affairs” go pretty far back, that is to say to the 8th century Taihô and Yôrô Codes. The former was merely an adaption of the governmental system of China’s Tang Dynasty whereas the latter already incorporated Japanese traditions and practical necessities of administration. Pretty much of these codes is known today as it had survived in original and transcribed forms and we find therein also a medical service statute, the ishitsu-ryô (医疾令). Depending on what you base your counting on, i.e. extant original fragments or later transcriptions of the code, the ishitsu-ryô consisted of either 19, 24, or 26 articles. It deals with the regulations regarding the training and appointment of physicians (e.g. regulations of how to become a physician, an acupuncturist, a massage therapist, a spirit-vanquisher by charms [charm healer] and so on), the duties of the court physicians (ten’yaku-ryô, 典薬寮) and the local physicians in the provinces, and the operation of medicinical-herb gardens. 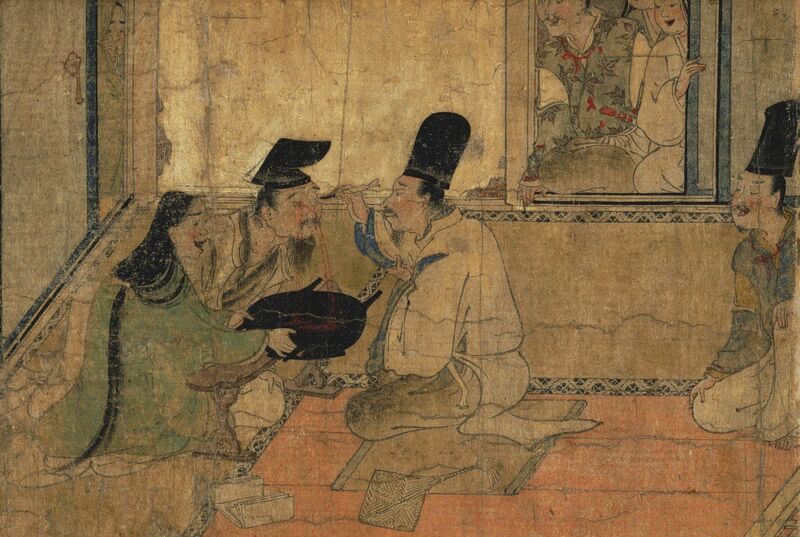 Eye surgery as seen in the late Heian to early Kamakura period picture scroll Yamai no Sôshi (病草紙). Well, most of the then know-how and the model for the aforementioned codes was imported from Chinese mainland and so it is no wonder that also medical science, i.e. the art of healing and of preventing diseases, came mostly from abroad. There were some indigenous physicians but it is assumed that they were rather healers and shamans and that there was no systematically accumulated and handed-down medical knowledgebase. Records of visits of mainland physicians date back to the 5th century AD but a more continuous and systematic exchange of medical knowledge only started with the missions to Tang China in the 7th, 8th and 9th centuries. The main carriers of this knowledge were Buddhist monks who played a major role in the entire “mainland exchange program.” Court physicians were given court titles, a requirement anyway to be be around in the imperial palace and to see and treat the emperor, and a kind of medical hierarchy started to develop. As far as medical knowledge is concerned, the latest trends, medicines, and treatments were constantly “updated” from Jin, Western Xia, Yuan and Ming Dynasty China. But we can see major changes from the Muromachi period onwards, on the one hand as the then established Ashikaga-bakufu was now introducing a medical service statute itself, i.e. for the ruling warrior class, and on the other hand that the entire approach of applying medicine and treating patients started to change. That means, in former times, physicians basically looked up the patients’ symptoms in their handed-down books and treated them or prescribed them medicine according to what was written in there. But now, physicians started more and more to rely on personal experiences and their own lifelong studies what in turn resulted in an increased body of medical publications, although often kept secret within a school or family. Returning to our main topic, the kinsô’i specialists for incised wounds, we rightaway have to go back again to the Taihô and Yôrô Codes. In these codes, it was distinguished between internal medicine (tairyô, 体療), surgery (sôshu, 創腫), pediatrics (shôshô, 少小), obstetrics (jo’i, 女医), otorhinolaryngology (jimoku-kushi, 耳目口歯), acupuncture (hari, 鍼・針), massage (anma, 按摩), charm healing (jugon, 咒禁), and herb farming (yaku’en, 薬園). But it has to be pointed out that the then surgeons did not carry out surgeries like we understand that term today. It was more a removing of tumors and swellings (shu, 腫) – thus the name sôshu – and treating external wounds like cuts and also burns. Later on, that means during the Kamakura and Nanbokuchô periods, the terms tairyô and sôshu were replaced by the terms naika (内科) and geka (外科) respectively. With the aforementioned significant changes in medical system over the Muromachi period, more specialists emerged and although some distinctions between tumor, furuncle, or boils removers and those who treat incised wounds had been going round since the Nanbokuchô period, there were now “real specialists” like the haremono-ishi (腫物医師, tumor surgeon), the kizu-ishi (疵医師, general wound surgeon), and the kinsô’i (金創医) and no longer just “surgeons” who performed all surgeries. And it is in my opinion safe to assume that it was the increased warfare during the Sengoku era which demanded specialized cut wound surgeons. Well, incised wounds had always been mentioned separately, for example in the ishitsu-ryô where we read that court physicians are required to provide and have in stock medicine for incised wounds. But now, treating incised wounds became a special field with a body of teachings on its own, very likely born from surgeons who had direct and constant battlefield experience similar to the European barber surgeons who looked after soldiers during or after a battle. An advancement in the successful treatment of incised wounds came with the exchange with European physicians like the Portuguese Luís de Almeida (1525-1597) towards the very end of the Muromachi period, for example due to the introduction of surgical suture. Well, Japanese records are pretty rare on this matter but just on the basis of thinking about the difficulties of treating larger open wounds and the existence of ancient Chinese records of sutures, I think it is logical to assume that wounds have had been sutured in Japan before the contact with European physicians. On the other hand, it seems as if a kind of “reinvention” of surgical sutures took place in the mid to late Edo period, “reinventure” because Western medicine was soon treated with suspicion or “neglected as a precaution” after the sakoku (鎖国, “locked country”) foreign relations policy enacted in the early Edo period. So it is also possible that even larger open wounds were mostly just treated with compression bandages and the like. For example, we know from Muromachi-eriod records that persons injured by sword cuts were treated with medicine taken internally, e.g. ginseng, Ligusticum wallichii, or peony roots, and that bleeding was stopped by sprinkling powdered resins with names like shôroku (松緑), furuse-ma (古瀬麻), or kirinketsu (麒麟血) onto wounds. And as a painkiller, ointments of rosewood or bulrush were directly applied on the wound. Also we read of urinating in a jingasa and applying the urin to the wound as a disinfectant. Guidance for putting on bandages from an early 19th century publication. Last I want to deal with the question who these kinsô’i were. In view of the fact that up to the Muromachi period many of the trained physicians were actually monks and because often priests of the Ji-shû (時衆) group accompanied the warriors onto the battlefield in the role of army chaplains (jinsô, 陣僧), battlefield physicians and thus kinsô’i are often equated with monks. Well, we do know that Ji-shû priests also acted as physicians but experts suggest to be careful in this respect. That is to say, also non-ordained persons who had specialized in treating incised wounds often shaved their heads when operating in or around a battlefield in order to avoid being shot and attacked. In other words, shaving your head identified you as a member of the clergy just like the red crosses or red crescent used by present-day protected persons in armed conflicts as international humanitarian law considers them as non-combatants (whether military or civilian) and thus they may not be attacked and not be taken as prisoners of war. Also because of the fact that kinsô’i were rather of low rank, we can assume that the majority of them did not come from academically trained and “qualified” physicians but were recruited from local and self-trained practitioners. I hope this was an interesting brief excursion to the history of battlefield-related medical staff in general and to the kinsô’i in particular, a subject that is as indicated not that widely known in sword-related fields. Congratulation for your articles is very very interesting. I’m a medincine student and traditional matial arts practicing in Padua, Italy. Can you give me some bibliographic references for a research about? Thank you very much, mr. Markus.